Released on Friday 30th June 2017. SIT 150 by Basil XM with the four track single Prisma (SIT 150 Anthem), including Original, Abide, & Danny Legatto mixes. After 7 years Stories In Trance hits the 150 mark and to celebrate we have a very special track by an extremely talented producer. Leading off is the Original mix. 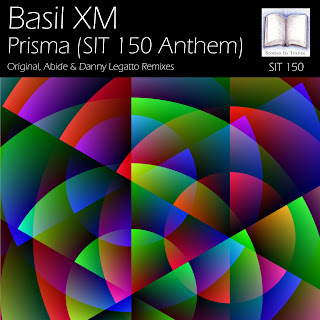 Basil XM makes his first original appearance after several excellent remixes on SIT, most recently his version of Thunderwolf's 4 Asia. Continuing with his trademark uplifting style of his previous work he's created an instantly recognisable lead melody, superb atmosphere, powerful low-end drive and crystal clear percussion. A seminal track to mark a massively significant landmark for SIT. The first remix comes from Abide. Hailing from Slovakia, Abide makes his first appearance on SIT. He is a producer we have admired for some time having made several appearances on some of trance's most notable labels so we were delighted to get him on-board with this remix. And with the quality of his work it's easy to see why, perfectly illustrated again here. With his remix he uses all the brilliance of the original and perfectly blends it with his own production technique to create a fantastic version, with power, energy and emotion, this is a great track. The final version comes from Danny Legatto. Polish producer Danny Legatto (AKA Roman Korbut) makes his fourth appearance on SIT following on from his fabulous remix of I5land's Word Of Interest (SIT 149). Danny sticks to his now well honed uplifting style whilst adding his own energetic touches to the piece. He uses the lead to great effect, perfectly complimenting the euphoric feel of the original with beautifully emotive layering. A nod of appreciation to SIT's own Dan Garton who's mastering excellence put the finishing touches to the Original and Abide mixes on this most special of releases.